That’s the most nervous I’ve ever been and obviously it showed. You get a break like that and I just started screaming at myself inside and you know, forget all of this stuff. Hit it left, or do anything but hit it there and how it stayed up was a miracle and so is winning the Masters. 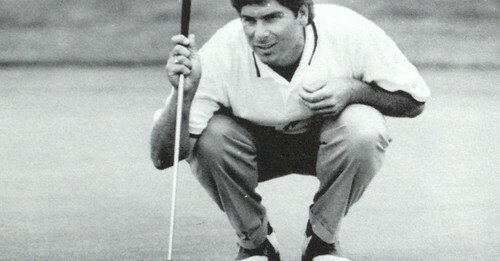 Fred Couples entered the 1992 Masters as the world’s number one ranked player, making him the first American to hold that honour since the Official World Golf Rankings were introduced in 1986. He was also saddled with the title of best player in the world without a major championship win on his resume. The silky smooth swing, the effortless power and boundless charm were all traits that made Couples a fan favourite, and a successful player on the course, but without the major victory, Couples would definitely be thought of as a guy who underachieved. Going into the weekend, it certainly looked possible that Couples would finally grab that first major, as he sat one shot behind leaders Craig Parry and defending champion Ian Woosnam, after firing rounds of 69 and 67 to open the tournament. While Woosnam struggled to a 73 on Saturday, Couples and Parry shot matching 69’s to be in the final group on Sunday, each seeking not only their first green jacket, but also their first major championship. Parry started out hot and actually extended his lead to three shots early in Sunday’s final round before collapsing to a 78 and placing part of the blame on abuse received at the hands of the patrons at Augusta National. The old adage is that the Masters isn’t won until the back-nine on Sunday, but Parry gave it away before that, giving Couples the opportunity to make history. Of course, he’d have to negotiate the treacherous three hole stretch of 11, 12 and 13 known as Amen Corner. Golden Bell has been the cause of frustration and joy for many players over the years. Jack Nicklaus calls it the greatest par-3 in major championship golf, while Tom Weiskopf still holds the course record for most strokes on any hole, when he put up a 13 here in 1980 after donating five balls to Rae’s Creek. The area was drenched with rain after Saturday’s third round, causing the creek to sit a little higher than normal, and as usual, players were having trouble with the traditional Sunday hole placement, middle right. As Couples approached the par-3 12th hole, he had a three-shot lead over good friend and mentor Raymond Floyd, who was playing in the group ahead. Lanny Wadkins made an eight there on Saturday after watching his ball roll down the embankment, as did Woosnam no more than 30 minutes before Couples got to the tee box. They’re just two examples of players who have seen their “just short” attempts roll into the creek. Couples had played the course enough times to know that there was one place not to miss, and that was short right, just in front of the pin. Lundqvist: If I were Fred, I would be running across the Hogan Bridge and getting to that ball before it rolls back into the water. Venturi: If he makes three here, this may be the luckiest three that I’ve ever seen on this hole in my life. Lundqvist: Think of the odds of that ball staying dry, hitting where it did. Not good. Venturi: How many times have you seen that stay dry from there? Couples indeed did move fast to get across the bridge and hit his second shot. His pitch couldn’t have been much better, landing a few feet from the hole. Somehow, Couples was going to escape with par, and walk to the 13th with his lead still intact. 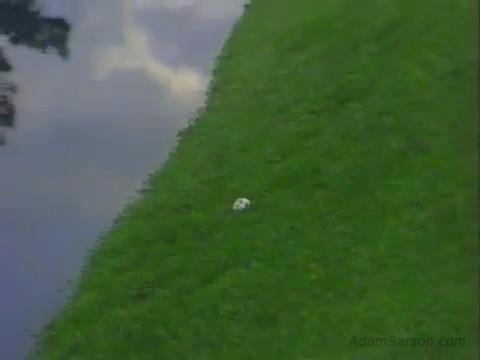 Even after seeing it happen, Couples didn’t seem to believe his own good fortune, so he pulled a ball out of the creek to test the slope. That one didn’t fall into the drink either, but it did drop further down than Couples initial tee shot. Obviously the situation and velocity with which these two balls came into the slope were completely different, but it helps to drive the point home that Couples really didn’t believe what he just saw. After he marked his ball and waited for Parry to putt out, Couples was still in disbelief, shaking his head at what I can only assume is a combination of his shot and the luck involved with the result. Sometimes the game doesn’t make sense. I actually watch that shot on TV. I could not believe it happen either. Freddie has been one of my favourites through the years and I was glad he caught a break. I truly was a shot for the ages. Thanks for bringing back awesome memories.